Did the Bible predict the next 72 hours? Not often NASA and the Church are on the same page but this freak Blood Moon seems to have done it! On Saturday evening, just as Passover draws to a close, an eery blood color will engulf the moon. It is the third of four successive total 'blood-red' lunar eclipses, each followed by six full moons - an extremely rare 'Tetrad'. Experts are predicting that the moon will be fully-obscured for five full minutes and that the rare phenomenon will be visible across North America, Asia and Australia. According to NASA the incredible alignment has only happened a handful of times in the last two thousand years. 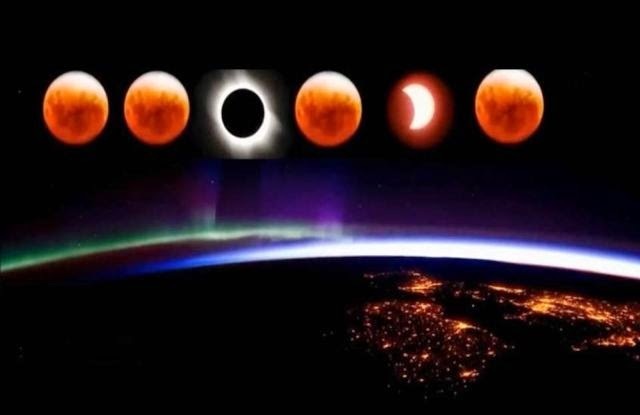 The Blood moon phenomenon was predicted in the Bible The King James Bible predicts: "The sun shall be turned into darkness, and the moon into blood, before the great and the terrible day of the Lord comes," (Joel 2:31). John Hagee, an American pastor, claims the strange timing of the event, between the anniversary of Jesus's death on Good Friday and His resurrection on Easter Sunday, proves a religiously significant global event is about to unfold. "There's a sense in the world that things are changing and God is trying to communicate with us in a supernatural way, he said to express.co.uk. Give your head a good shake!!!! !